Duncan McCabe looks ahead to #RIC2016 which takes place later this month. The strength of the Yes campaign lay in its diverse character, emerging from the grassroots to shake the UK state to its foundations. This was not a one party campaign, directed by strategists and dominated by party cadres, but a genuinely popular movement which set its own agenda and sought independence as a necessary step in building a more equal society. Since those heady days however, the pro-indy movement has been pushed back into party politics with the SNP the beneficiaries of all the hard work done in 2014. The assumption within the SNP has always been that their party, and their party alone, is the vehicle for the achievement of Scottish Independence and all other political opinions should be sacrificed to this end. Their apparent massive electoral support is the result of this assumption becoming manifest among many Yes voters, but many of those who voted SNP last May did so through gritted teeth and since then that party’s 56 MP’s have produced no significant gains for the people of Scotland. The substitution of the SNP hegemony over the previous Labour version is not real progress in the struggle for autonomy or equality. Lacking any clear road-map to Indy they are failing their own supporters, especially those who joined the party following the referendum. The Radical Independence Conference 2016 seeks to fill this vacuum of ideas by allowing key figures from the wider Yes movement a space to outline a variety of Routes to Independence in its key opening session, as well as in a more participative workshop setting. Jim Sillars, Cat Boyd, Robin McAlpine, Maggie Chapman and others will offer different options for a renewed independence movement which rises above the tribalism of party politics. We need only look to the strength of the grassroots non-party movement for independence in Catalunya to realise how important it is not to have our cause linked to one party alone. Independence is not in the ownership of any party but in the collective ownership of the people. There is not one route to independence, rather there are 5.3 million routes to independence just as all 5.3 million of us have to become the roots of change. 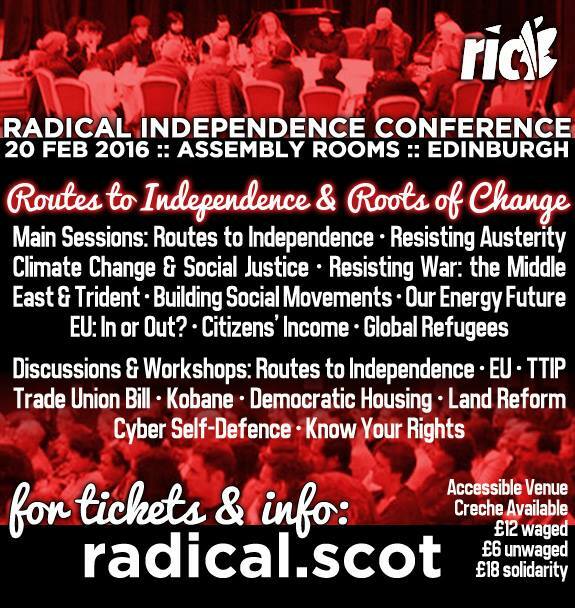 The annual Radical Independence Conference will be held on Saturday 20 February, at the Assembly Rooms in Edinburgh. A year on from the referendum, Dundee Rep have brought John McGrath’s seminal 7:84 play back to the stage in their own revived, updated production which has been playing to full houses every night, but for Duncan McCabe ” it failed to weave the 21st Century narrative effectively into the original and as a result the end product just didn’t fulfill it’s full potential”. The ecological problems caused by each of items of the title can not be underestimated, but they have too often been overlooked, and the Dundee Rep interpretation of John McGraths play was no exception. In 1973 such omissions could be more easily understood as climate change resulting from excess carbon in the atmosphere had yet to be recognised as a threat to human survival, though oil pollution was generally recognised as a bad thing. 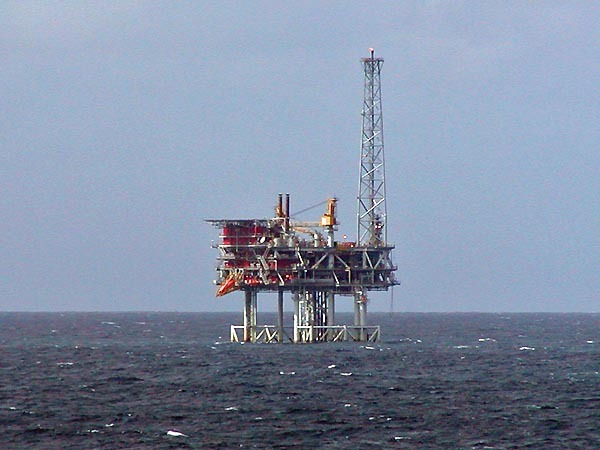 Today it is less excusable, and as the performance sought to put the play into a post-referendum context, its inexcusable not to have at least questioned the continued exploitation of the North Sea oil reserves. Instead, oil was a good thing as long as it’s exploitation was in the hands of the people (or was that the state?) and faith was placed in technological advances to allow even more to be extracted. Yes campaign propaganda was regurgitated about Norway and oil fund, which is fair enough up to a point, but it is worth noting that the Norwegian oil fund, a relatively ethical investor, has recently stopped investing in an oil sector increasingly seen as a potentially toxic asset. The portrayal of the poor oppressed oil worker, genuine enough in ’73, appeared ludicrous today with those working offshore being some of the best rewarded workers in the country. As the opening of the play states, our future is as yet unwritten, but that future can’t be based on oil any more than it should on deer or sheep. The introduction (or discovery) of all three has had lasting effects not only on the people and their culture but also, and possibly more deeply, on our environment. The future as far as energy is concerned belongs to renewables not oil, and the most important and pertinent aspect today, not only in the Highlands but throughout Scotland, is the need for community and public ownership of that resource and the need to end the Crown Estates control of the seabed. Also, given that so much of the play is about land and popular resistance to clearance, enclosure and private ownership, it was even more strange that no mention was made of the community ownership patterns beginning to emerge in parts of the Gaeltacht nor of the reasons for the current repopulation, which was mentioned, but without any context or analysis. 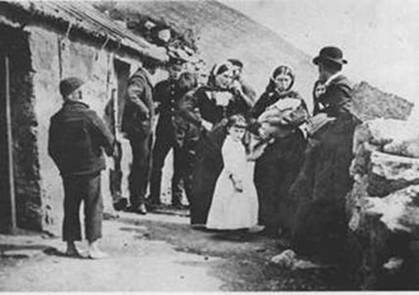 The play could have celebrated the successful struggles of communities at Assynt and elsewhere to take ownership of their land, and sought to highlight the need for more radical land reforms than proposed in the current legislation being discussed at Holyrood. I can’t imagine such key issues being omitted from a 7:84 revival of the play. That said the performance was enjoyed by a packed house and was given a standing ovation on the night of my visit, suggesting political theatre can still exert a powerful influence. The pantomimic episodes were funny and increased the accessibility of the play which was one of the important aims of the original production – taking theatre to the people. They raised huge applause, notably with the “I’m still Yes” line, and despite being somewhat disconcerting the David Cameron intervention (even without his pig) was genuinely hilarious. There was indeed much to be commended in the Rep production; the informal ceilidh style set and audience interaction; the music and the cast’s excellent Gaelic learning skills; the passion and commitment with which it was delivered; but ultimately it failed to weave the 21st Century narrative effectively into the original and as a result the end product just didn’t fulfill it’s full potential. “The economy has to be the key issue for winning a second referendum. Independence will only come when a clear majority of Scots have confidence in the wealth and resources of their country” says Alister Rutherford as he reflects on indyref #1, uncertainty, and the lessons to be learnt. With the first anniversary of the referendum upon us, it is as a good a time as any for a bit of reflection. Like just about everyone who participated in the Yes campaign I found it an exhilarating, exciting and rewarding experience. We failed to convince a majority of our fellow citizens, but we did convert hundreds of thousands and the momentum was clearly with Yes. This momentum has continued and it is the pro independence side that remains the more buoyant, determined and optimistic. I share in this determination and optimism. I remain convinced that independence is the right way forward for Scotland. My reasons remain the same. Basically that the key decisions about the future of Scotland should be taken by the people who live here. It’s all about democracy and taking responsibility for our future. I reckon that a majority of Scots also share this position. Alas, we did not convince enough of them that Scotland was economically viable as an independent country. Worries about our long term economic viability were expressed in many ways. Fears that an independent Scotland would not be able to afford the pensions for older people. The fear that many businesses would leave the country. Allied to this the fear that if Scotland was out of the EU this would damage our economy. The worry that Scotland was too dependent on (declining) revenues from the North Sea. Finally, fears about the currency of an independent Scotland – what if Westminster said no to us using the pound? All of the above factors were influential in creating a climate of fear about the economic prospects of an independent Scotland. They were together the main weapon of the No campaign. In this they were ably abetted by our very biased media, who kept up a constant barrage of scare stories and fears throughout the referendum campaign. So I agree with those who believe that it was the failure to convince more people about the long term economic viability of an independent Scotland that lost us the referendum. It is many ways a wonder that we managed to convince so many, given the hostility to our campaign. Where I part company with many on the economy factor is that I do not believe that the currency was in itself the crucial factor. A factor yes, but for me, no more important than the others mentioned above. From my perspective, currencies are just not that important. Just about all the independent countries in the world have their own currency. Yet the economic performance of these countries ranges from the abysmal to very good. Equally there is no clear pattern to discern from among the few countries that either share a currency or just use someone else’s currency. Greece, Ireland and Portugal have all had economic woes, but so have lots of other countries with their own currency, including our very own UK. What was damaging in relation to the currency question was the uncertainty that surrounded it. Would Westminster agree? How strong or weak would an independent currency be? But this was the same with all the factors around the economy. There was uncertainty about the EU, about just how rich and viable Scotland was. Uncertainty is the name of the game. Uncertainty applied as much to the UK and staying in the UK. But nobody in the media was prepared to pose these questions or rigorously challenge the Unionists on the long term viability of the UK in either economic or social well being terms. expert on Denmark, but I find it impossible to work out just what natural advantages Denmark has over Scotland. 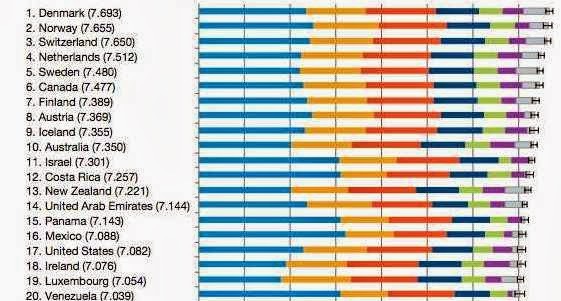 Yet nobody, not even in the No campaign would suggest that Denmark is not one of the most successful countries in the world. Nobody ever suggests that Denmark should not be an independent country on the grounds that it is too small and too poor. So why did we not challenge Unionists to demonstrate with evidence why Scotland, unlike Denmark would not be similarly successful? The economy has to be the key issue for winning a second referendum. Independence will only come when a clear majority of Scots have confidence in the wealth and resources of their country. The perilous state of the UK economy and its uncertain future should offer us fertile ground for building the general case that Scotland has all the resources needed to be a stable and successful country. This will not be about specific policies, but about the basics of the economy – the rich range of natural and human resources at our disposal. “The real initiatives …….. can and and must originate from outwith the party political structures and be rooted in ideas of grassroots democracy.” Duncan McCabe looks at the development of radical alternatives in the year following indyref. As the anniversary of the referendum approaches, it’s easy to wallow in a nostalgia for the halcyon days of comradeship and common cause that characterized the Yes movement. But politics moves on, parties vie for position and governments act like governments. The hopes of many hundreds of thousands were placed in delivering an unprecendented electoral victory to the SNP in May, only to discover that six or fifty-six, their MP’s make little impact on the entrenched intransigence of the archaic Westminster system. It’s a lesson supporters of Jeremy Corbyn may also have to learn as even if Labour were to win the next general Election, even if they won 656 seats, the rest of the UK’s own troika, Whitehall and the City, would resist and stifle any meaningful change. Of course it should be no surprise to us that the Westminster system is unmoved by the SNP success. The lack of genuine democracy in the UK is one of the prime reasons for independence and the the SNP’s impotence in London just re-inforces the need for genuine self-government. Let’s stop waiting in vain for change from the top that never comes. Independence won’t be given, it has to be taken and we must begin that process now. We must begin to disengage not just from Westminster, but from the control of the City of London and the global corporations. The real initiatives that can bring this about can and and must originate from outwith the party political structures and be rooted in ideas of grassroots democracy. Potentially the most important and far-reaching of such initiatives at the national level has just been launched. Scotpound, the Scottish digital currency being developed by the New Economics Forum and Commonweal, is the fundamental requirement of a future co-operative locally-based economy freed from the shackles of the global financial elite. The idea had previously been outlined by Duncan McCann of NEF at the RIC2015 Spring conference in Dundee. Even at 1% of the money supply it can impact on individual lives and strengthen local economies. Given support from local and national government it could grow quite quickly and, if successful, would lessen the fears associated with ‘losing the pound’ in any future indyref2. Indeed Robin, but our governments all seem to tend towards conservatism once in office and the SNP are no exception. Locally, another idea of the immediate post-referendum period was the creation of networks of food-co-ops to provide good-quality food at reasonable prices, building an alternative to the supermarkets. 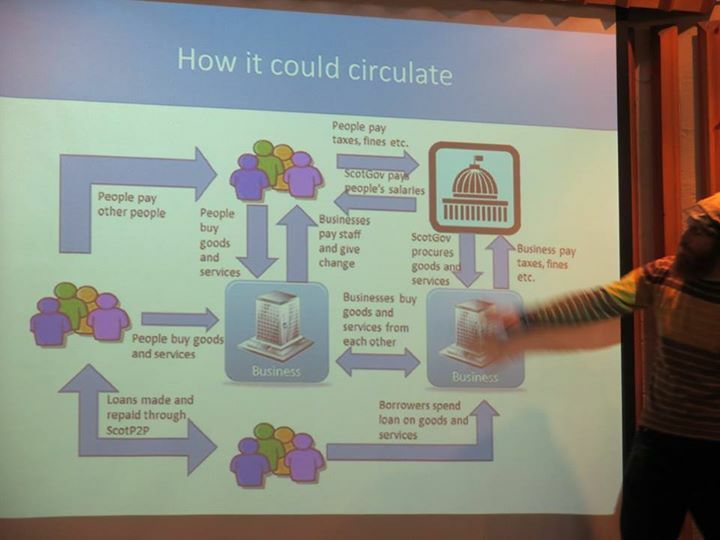 Along with community renewables schemes, potentially resourced from not-for-profit community share issues, possibly even using the Scotpound digi-currency, the foundations of an alternative grassroots-driven economy can begin to be discerned. But progress is slow, and although it is important that these initiatives come from community or independent sources, local government in particular can have a catalyzing and supportive role. But too often it seems our councillors prefer the grand designs of expensive prestige projects to enhance civic pride, rather than supporting or investing in people. They urge us to “Take Pride in Your City”: A city where 42% of households live in fuel poverty, whose much vaunted new ‘café society’ is built on minimum wages and zero-hour contracts, and a city which has the worst rates of sexual crime in Scotland. This city, this country, needs change, it needs innovation, but it needs to put its people first. We need to move beyond protest and start to build. Lets stop demanding that some high heid yins to do it for us, regain our common cause and comradeship, and begin to sow the seeds of lasting sustainable change ourselves. Ahead of Saturday’s Solidarity with Greece demonstration in Edinburgh, Alistair Rutherford considers Syriza’s options. The rather sudden and unexpected decision by the Greek government to hold a snap referendum on the latest proposals from the Troika has caught everyone by surprise. Something does need to be done to bring this long running and seemingly never-ending merry-go-round to an end, one way or another. Whether this particular referendum will help resolve the crisis is open to question. The basics are pretty well known. Greece is effectively insolvent. Its debt burden is too great for it to have any prospect of ever repaying this debt. The unprecedented additional austerity measures proposed by the Troika, in the view of most people, will only make things worse. 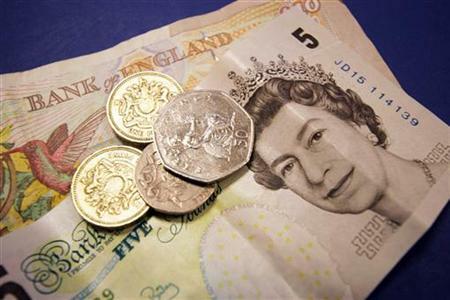 Most of the additional loans go immediately back to the lenders in the form of repayments on previous loans. Hence the merry-go-round analogy. Very little of the loans go to helping the Greek population. While the greater the austerity the greater the long term damage to the Greek economy. Yet the Troika seem even more determined than ever to force further austerity on Greece. As Paul Krugman puts it, it has been an act of monstrous folly on the part of the creditor governments and institutions to push it to this point. How should Greece respond? The Syriza led government has responded by proposing to hold a referendum for next Sunday. The Greek parliament has voted in favour of holding this referendum. But will the referendum provide a clear cut result for a way forward? Alexis Tsipras, the Greek Prime Minister has stated that an emphatic “no” vote would strengthen Greece’s negotiation position. The obvious question here is negotiating what? An improved bailout agreement or an exit from the euro? The referendum question says nothing about the euro and only refers to the bailout agreement. There is a further doubt about the validity of the referendum and that is that the draft document referred to, in effect no longer exists. So the Greek people are being asked to accept or reject a proposal that is no longer available. What’s the point of this? A further problem with the referendum is that in order to secure any kind of strengthening of Greece’s negotiating position, Greece needs to still be in euro by the time the referendum is held. Will it? The Greek government has asked the EU to extend the current agreement for another two or more weeks to allow the referendum to take place, but this has been rejected. Unless something is agreed today, Sunday, then on Wednesday, 1st July Greece will have defaulted on its repayment to the IMF. Before then, absent an agreement with the EU/ECB, there will most likely be a run on Greek banks. To prevent this the Greek government will have to declare an extended bank holiday and probably institute capital controls to prevent euros draining out of Greece. This is where it all gets very messy indeed. Greece almost certainly needs to default on most, if not all of its debts. The real issue is whether this is done in an orderly and agreed manner, or is done abruptly without agreement. This could happen if Greece is either forced out of the euro, or voluntarily decides to leave the euro. The big problem for Syriza is that all the indications are that a large majority of Greeks want both an end to austerity and to stay in the euro. Which is why the referendum question does not mention the euro. However if by the time the referendum is held, next Sunday, it is clear to all that a rejection of the bailout agreement means leaving the euro, how will the Greek people vote then? For underlying all this is the uncomfortable reality that there is no good option for Greece in the short to medium term. And the long term may be a very long time coming. Leaving the euro will not bring about an end to austerity. It may change who suffers most from continuing austerity, but things are likely to get even worse for many Greeks with a euro exit. There is no short term, painless fix for the Greek economy. A further complication is that many legal and economic commentators have opined that even with a default there is no need for Greece to leave the euro. In fact it seems there is no legal, treaty based way for any eurozone country to be expelled from the euro. So, at least in theory, Greece could default on some of its debt, and try and remain in the euro. What this might mean in practice is unknown and at the moment unknowable. Much would depend on how willing the ECB and Greece’s partner countries would react. The prospects do not look good. I agree with Paul Krugman that the governments of the eurozone countries have been acting with monstrous folly in relation to Greece. Alas democracy has never guaranteed the election of sane and reasonable governments. In the eurozone all governments have the same democratic validity. It does no good to anyone to pretend that the wishes of the Greek people are more worthy than the wishes of others. More Independence for Local Government? Greater financial autonomy for local government in Scotland would improve accountability and democracy. The RIC Dundee Local Tax Reform submission to the Commission on Local Tax Reform contrasts local government in Scotland with that of municipalities in many other European countries, where smaller local authorities raise more of their own revenue, exercise far more powers and in doing so strengthen their local democracy, accountability and autonomy. “The current freeze on Council tax has deprived local authorities of an essential part of their democratic legitimacy and accountability – the right to make their own choices on raising at least some of their revenue.” said submission co-author Sarah Hendry. In our submission to the commission, we give support to a form of land taxation as a possible alternative to the current council tax system. However, if Council Tax was to be retained, RIC Dundee argue that full revaluation would be required and possibly the introduction of new bands to improve the progressive nature of the tax. Following last week’s election result, Alister Rutherford looks at prospects for a second referendum and asks, under what conditions do we want one? General Election 2015: What next? Duncan McCabe looks at the implications of last weeks GE2015 result and possible strategies for the radical independence movement. Join the discussion at 7pm Thursday 14th May, Chambers East, Meadowside, Dundee with invited guests Maggie Chapman and Carolyn Leckie. The election result puts into sharper focus than ever the political divide between Scotland and England. Our democratic deficit is clear and whilst the spotlight is on the SNP landslide, that difference is also expressed by the 1 in 8 voters in England who voted UKIP, while that party received only a derisory number of votes in Scotland. The first past the post electoral system has been rightly criticised, but in Scotland the increasingly astute Yes movement used it and voted tactically for the SNP to great effect. The SNP’s 50.2% is a result of the ’45’ voting tactically, and it is unlikely that many No voters have been converted since the referendum. It is important to remember this as calls for a second referendum become louder. The SNP ran an anti-austerity campaign to great effect but with a majority Tory government they will find themselves powerless to stop it. It is possible that this scenario may swing more Scots behind calls for a second referendum, but at the very least a quarter of a million No voters must be converted to Yes and this needs more than slogans and demonstrations. Continuing austerity means we must not only devise a coherent strategy for achieving independence as soon as possible, but also build a stronger, watertight economic case which solves the currency problem, comes to terms with low oil prices, and is both radical and implementable. We also need to be able to take this case to ‘middle class’ voters who were less inclined to vote Yes last year due to fear mongering about higher mortgage and insurance costs, and are less directly affected by austerity measures as well as elderly voters worried about pensions. The RIC Spring Conference in Dundee was a starting point for a detailed discussion on a radical plan for independence, but much more work must be done and done fast if we want to be sure we can win a second indyref by 2020. A No vote in a second referendum would be an umitigated disaster. RIC has recently developed a non-hierarchical constitution and put in place working groups on different policy areas. We are trying to create the structures required to build a democratic movement which can win the next referendum. It will not be enough to leave it all to the SNP or any other political party. Only the people can build a People’s Scotland. Secretary and a member of PCS General Executive Council. candidate for the Trade Union and Socialist Coalition (TUSC). Beyond the General Election – potential for trade unions in building a more progressive future. taking solidarity action via grassroots democracy. discussion and democratic engagement as well as the benefits of social media strategies. the prospects for a new, complementary currency for Scotland. and can fulfil specific social, economic and environmental goals. the potential to become the main domestic currency in an independent Scotland. The afternoon World Cafe sessions were primarily devoted to generating ideas that my prove useful in creating an alternative narrative. The following responses were to the question – What is the economy for? would a citizen’s income replace all benefits? would some people still need additional support? how to deal with the wealthy and with privatisation?